New aerial as ov November 2004! Notice the arena construction and about 3/4 on the right at the very bottom is the new courthouse under construction! Take a good look because Charlotte is soon to get a few new towers which will make a pretty big impact on those surface lots! Makes you wonder where we'll be at in another 30 years! Awesome pics! I really should visit Charlotte someday. wow monsoon, when was that photo from? I can't even tell which buildings are still standing today!!! 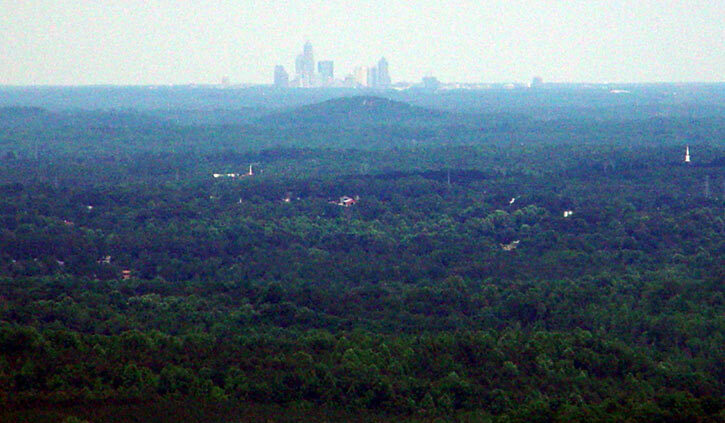 That old photo kinda reminds me of Greensboro with 4 really tall buildings forming a linear skyline. nice pic. Truelly the "evolution" of Charlotte is quite impressive. Wow. Charlotte has come a long way. The aerials are really neat looking. stumbled on this, from crowders mountain 25 miles away. Aerial photos are always great. Those are particularly good ones too. Those surface lots on the northeastern side of uptown are more obuios in those shots. That crowders mountain photo looks blown up a bit. I rather like this view--it really only shows the core of uptown in pretty good detail. All the surface lots you see in that pic are owned by Daniel Levine...he moves at a snails pace for development. I think a total of a million sutdys have been done on that land and nothing has happened. The up side of his mollasses speed is that when they do get developed, they are built up to be more intense developments than if he had acted earlier. Looking at the on-fire residential market right now.... what if he HAD developed some of his land in 2001, they'd be 3-5 story buildings. Now, there is a shot that the buildings on those blocks will be >10, > 20 or even >30 stories when he does builds. I guess he is in for so little, and for a long term requirement for return that he is NO hurry . That is painful for all of us development addicts, but i'm sure it is probably better for uptown in the long run. (this coming from a guy who really thought they were starting any minute when i moved to first ward 4 years ago ).